Belmont is a primarily residential neighborhood geographically located in the Bronx in New York City. Its boundaries, starting from the north and moving clockwise, are Fordham Road to the north, Bronx Park to the east, East 181st Street to the south, and Third Avenue to the west. These boundaries give the neighborhood a crescent-like shape. The neighborhood is noted for its "close-knit community" and "small town feel," and as a result of its cultural history and wide array of Italian businesses, is widely known as the "Little Italy of the Bronx." 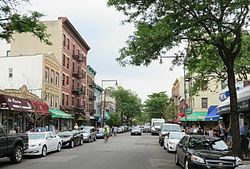 Arthur Avenue, a street noted for its prominent local restaurants and markets, is the primary thoroughfare through Belmont. The neighborhood is part of Bronx Community Board 6, and its ZIP Codes include 10457, 10458 and 10460. The area is patrolled by the New York City Police Department's 48th Precinct. During colonial times, the land that would become Belmont was covered in farmland, much like the rest of western Bronx, and it was the province of the Lorillard family, for whom a street is named. After moving its tobacco operations from Lower Manhattan to the central Bronx in the late-18th century, the family greatly expanded its property in the area, with its land known as the Belmont estate. After the Lorillards moved to New Jersey in 1870, the city acquired part of their land for Bronx Park; another part was divided into the streets that form Belmont today. In the mid-1880s, a large influx Irish and German immigrants began moving into the neighborhood. The neighborhood became very dense after the construction of the Third Avenue El. After the construction of the Bronx Zoo and the Jerome Park Reservoir at the turn of the 20th century, a large wave of Italian immigrants moved into the area. 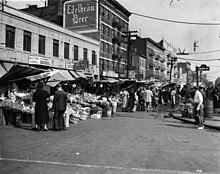 With a strong pattern of Italian immigration, Belmont was soon considered the Little Italy of the Bronx. This Little Italy was centered at Arthur Avenue and East 187th Street; although the historical and commercial center of "Little Italy" is Arthur Avenue itself, the area stretches across East 187th Street from Arthur Avenue to Prospect Avenue, and is similarly lined with delis, bakeries, cafés, and various Italian merchants. The neighborhood still holds an annual Ferragosto celebration on Arthur Avenue each September. Like many other neighborhoods in New York City, Belmont became disenfranchised starting in the mid-20th century. The city dismantled the Third Ave Elevated in 1973, and the poor accessibility in comparison to other neighborhoods further accelerated the decline. Housing stock was lost to arson, some of it razed by the city in the late 1970s and 1980s. Starting in the mid-1990s, the neighborhood experienced a construction boom, despite the majority of its buildings were built before 1939. The neighborhood has also maintained its reputation as a thriving business area due to its abundant shops, restaurants, and markets. The community retains its reputation as the Bronx's Little Italy despite its smaller Italian population (prior to the millennium, the neighborhood was made up of over 50% Italian residents), and is often cited as New York City's "real Little Italy", in opposition to the Little Italy of Manhattan. Albanians and Puerto Ricans have added to the mixture of businesses on Arthur Avenue and East 187th Street. Still, the Italian presence is felt with a number of long Italian-owned small businesses including restaurants, bakeries, delis and other merchants. The neighborhood's residents are a diverse mix of races, ethnic groups, religious affiliations, sexual orientations, and national origins. Traditionally the Italian heart of the Bronx, the neighborhood now contains a significant population of Hispanic and Latino Americans, Albanians, long standing Italians and more recent Italian immigrants. Many Mexican families have moved into the Belmont neighborhood, which hosts the annual Bronx Cinco de Mayo Celebration. Gradually, there have been more Hispanics and Latinos moving into the neighborhood. Hispanics and Latinos make up the largest ethnic group in the neighborhood as of the 2010 census. Like most neighborhoods in New York City the vast majority of households are occupied by renters. Almost half of the population lives below the federal poverty line and receives public assistance (Temporary Assistance for Needy Families, Supplemental Security Income, and Medicaid). However, there is significant income diversity on a block-by-block basis. The neighborhood is also home to a large population of students at Fordham University who reside in the university's off-campus housing as well as private apartment buildings in the area. Based on data from the 2010 United States Census, the population of Belmont was 27,378, an increase of 1,411 (5.4%) from the 25,967 counted in 2000. Covering an area of 313.34 acres (126.80 ha), the neighborhood had a population density of 87.4 inhabitants per acre (55,900/sq mi; 21,600/km2). The racial makeup of the neighborhood was 19.7% (5,381) White, 18.5% (5,059) African American, 0.1% (38) Native American, 2.3% (620) Asian, 0.1% (18) Pacific Islander, 0.3% (84) from other races, and 0.9% (249) from two or more races. Hispanic or Latino of any race were 58.2% (15,929) of the population. Belmont is dominated by 5 and 6-story elevator and walk-up apartment buildings but the residential streets are lined with a vibrant blend of housing types including rowhouses and larger Art Deco and Tudor Style apartment buildings. The majority of the architecture in the neighborhood dates before 1939, and exhibits pre-war architecture. In the last decade, construction of modern 2 and 3 unit row-houses and apartment buildings have increased the percentage of owners versus renters. The land area is roughly 0.3 square miles (0.78 km2), and the terrain is relatively low laying and flat. Among the neighborhood's array of Italian restaurants and markets, there are multiple landmarks. Our Lady of Mount Carmel is a Roman Catholic church located on E. 187th Street at the corner of Belmont Avenue. The church was constructed in 1906. The Arthur Avenue Retail Market, which extends the block between Arthur Avenue and Belmont Avenue, features an array of Italian meats, cheeses, and other market goods, as well as cigars, a bar, and dining area. Parks in the area include the Ciccarone Playground, and the D'Auria Murphy Triangle located at 183rd Avenue, which features a Christopher Columbus monument. Theodore Roosevelt High School, a large public school opened in 1918, served the area. The Bronx Zoo and the New York Botanical Garden are also located at the northeastern edge of Belmont, and attract worldwide visitors. Adjacent to the Bronx Zoo and the Botanical Garden is the campus of Fordham University, whose campus runs along the northern edge of Belmont, along Fordham Road. It is a private Roman Catholic university, originally established as St. John's College in 1841. The campus features Collegiate Gothic architecture and is frequently listed among the most scenic campuses in the country. The campus has been used as a filming location for a large number of movies, including A Beautiful Mind, Center Stage, and The Exorcist. The 48th Precinct has a lower crime rate than in the 1990s, with crimes across all categories having decreased by 71.7% between 1990 and 2018. The precinct saw 11 murders, 29 rapes, 276 robberies, 396 felony assaults, 182 burglaries, 424 grand larcenies, and 76 grand larcenies auto in 2018. Belmont contains two New York City Fire Department (FDNY) fire stations. Engine Co. 48/Ladder Co. 56/Division 7 is located at 2417 Webster Avenue, while Engine Co. 88/Ladder Co. 38 is located at 2223 Belmont Avenue. The nearest hospitals are St Barnabas Hospital in Belmont and Bronx-Lebanon Hospital Center in Claremont. Belmont is covered by the ZIP Code 10458. The United States Postal Service operates two offices nearby: the Fordham Station at 465 East 188th Street, and the Mount Carmel Station at 652 East 187th Street. Belmont and East Tremont generally have a lower rate of college-educated residents than the rest of the city. While 19% of residents age 25 and older have a college education or higher, 36% have less than a high school education and 45% are high school graduates or have some college education. By contrast, 26% of Bronx residents and 43% of city residents have a college education or higher. :6 The percentage of Belmont and East Tremont students excelling in math rose from 19% in 2000 to 44% in 2011, and reading achievement increased from 25% to 30% during the same time period. The New York Public Library operates the Belmont Library and Enrico Fermi Cultural Center, located at 610 East 186th Street. The branch opened in 1981 and contains an extensive collection of Italian-language materials, as well as work by Italians and Italian-Americans. Railroad service is provided by Metro-North's Harlem Line and New Haven Line at Fordham station. The closest New York City Subway station is about a mile west of Belmont, at Fordham Road, which is served by the B and ​D trains. Lesandro Guzman-Feliz (2002-2018), murder victim who was killed by members of the Dominican gang Trinitario. Fred Milano (1939–2012), vocalist from The Belmonts. Chazz Palminteri (born 1952), actor, raised in Belmont. The film A Bronx Tale (1993) starring Robert De Niro was set in the neighborhood and the main character Sonny tells Calogero that he was attending the University of Belmont Avenue. The opening scene of 1955's Marty was shot on Arthur Avenue. Other films with scenes shot on location in Belmont include The Seven-Ups and The Incident. The character of Leonard in James Frey's novel A Million Little Pieces grew up in the neighborhood. See also the movie Death Wish 3. ^ "NYC Planning | Community Profiles". communityprofiles.planning.nyc.gov. New York City Department of City Planning. Retrieved March 3, 2018. ^ a b c d e "Belmont neighborhood in Bronx, New York (NY), 10457, 10458, 10460 subdivision profile - real estate, apartments, condos, homes, community, population, jobs, income, streets". City-Data.com. Retrieved October 19, 2015. ^ "Center for Urban Research". Archived from the original on October 13, 2015. Retrieved October 10, 2015. ^ a b c Donovan, Aaron (July 29, 2001). "If You're Thinking of Living In/Belmont; Close-Knit Bronx Area With Italian Aura". The New York Times. Retrieved October 17, 2015. ^ a b Sitler, Rosemary. "Authenticity and Arthur Avenue". Brooklynrail. Retrieved October 19, 2015. ^ "Bronx Community District 6" (PDF). Retrieved October 10, 2015. ^ a b "NYPD – 48th Precinct". www.nyc.gov. New York City Police Department. Retrieved October 3, 2016. ^ "Belmont in Forgotten NY". Retrieved October 10, 2015. ^ "Belmont BID - History". Retrieved October 10, 2015. ^ a b c "Belmont Demographics". Food Communities of NYC. Retrieved October 20, 2015. ^ a b "If You're Thinking of Living In/Belmont: Close-Knit Bronx Area With Italian Aura". The New York Times. Retrieved October 10, 2015. ^ Cinotto, Simone. Making Italian America: Consumer Culture and the Production of Ethnic Identities. Oxford University Press. p. 226. ^ Dilorenzo, Sarah (September 11, 2011). "Arthur Avenue: New York's Real Little Italy?". The Huffington Post. Retrieved October 19, 2015. ^ "The Bigger Little Italy". The New York Times. Retrieved October 10, 2015. ^ Williams, Jaime (April 27, 2014). "Belmont to Celebrate Cinco de Mayo". Bronx Times. Retrieved April 27, 2014. ^ Semple, Kirk (July 7, 2010). "In an Italian Enclave in the Bronx, Signs of Mexico Begin to Show". Retrieved October 19, 2015. ^ a b c "Belmont Demographics". Belmont Demographics. March 4, 2012. Retrieved October 19, 2015. ^ "Arthur House". Fordham University. Retrieved October 10, 2015. ^ a b c d e f g h i j k l m n o "Belmont and East Tremont (Including Bathgate, Belmont, Bronx Park South, East Tremont and West Farms)" (PDF). nyc.gov. NYC Health. 2018. Retrieved March 2, 2019. ^ "NYC-Bronx Community District 3 & 6--Belmont, Crotona Park East & East Tremont PUMA, NY". Census Reporter. Retrieved July 17, 2018. ^ Remigius Lafort, S.T.D., Censor, The Catholic Church in the United States of America: Undertaken to Celebrate the Golden Jubilee of His Holiness, Pope Pius X. Volume 3: The Province of Baltimore and the Province of New York, Section 1: Comprising the Archdiocese of New York and the Diocese of Brooklyn, Buffalo and Ogdensburg Together with some Supplementary Articles on Religious Communities of Women.. (New York City: The Catholic Editing Company, 1914), p.390. ^ "Attractions". The Bronx Little Italy.com. Retrieved October 19, 2015. ^ "Arthur Avenue | The Real Little Italy of New York". Arthuravenuebronx.com. Retrieved December 15, 2013. ^ "Pretty college campuses – Travel – Destination Travel | NBC News". MSNBC. September 15, 2008. Retrieved December 15, 2013. ^ "Belmont and Bathgate, East Tremont – DNAinfo.com Crime and Safety Report". www.dnainfo.com. Retrieved October 6, 2016. ^ "48th Precinct CompStat Report" (PDF). www.nyc.gov. New York City Police Department. Retrieved July 22, 2018. ^ "Engine Company 48/Ladder Company 56/Division 7". FDNYtrucks.com. Retrieved March 14, 2019. ^ "Engine Company 88/Ladder Company 38". FDNYtrucks.com. Retrieved March 14, 2019. ^ "Tremont, New York City-Bronx, New York Zip Code Boundary Map (NY)". United States Zip Code Boundary Map (USA). Retrieved March 14, 2019. ^ "Location Details: Fordham". USPS.com. Retrieved March 7, 2019. ^ "Location Details: Mount Carmel". USPS.com. Retrieved March 7, 2019. ^ "Belmont and East Tremont – BX 06" (PDF). Furman Center for Real Estate and Urban Policy. 2011. Retrieved October 5, 2016. ^ "About the Belmont Library". The New York Public Library. Retrieved March 14, 2019. ^ "Bronx Little Italy @ Arthur Avenue & East 187th St". Places to Go in New York. Retrieved April 12, 2016. ^ "LANA DEL REY – "AT HOME" EXCLUSIVE COVER SHOOT & INTERVIEW". Galore. December 1, 2014. Retrieved October 18, 2015. I would take the D train to Coney Island, take the D train back to the Bronx where I lived on Hughes Avenue. ^ "Christine Jorgenson Biography". Biography.com. The Biography Channel. Retrieved May 7, 2016. ^ Slotnik, Daniel E. "Carlo Mastrangelo, a Doo-Wop Voice for Dion and the Belmonts, Dies at 78", The New York Times, April 6, 2016. Accessed June 17, 2016. "They formed the Belmonts in the mid-1950s, taking the band name from the avenue where Mr. Milano lived. (The neighborhood is also called Belmont.)" ^ Cunningham, Jennifer H. "Actor Chazz Palminteri stages a Bronx return to benefit his charity"], New York Daily News, October 3, 2013. Accessed June 17, 2016. " Bronx boy-turned-Hollywood star Chazz Palminteri is back on the block. The Belmont product has returned to the borough to perform his autobiographical one-man show, A Bronx Tale, on Oct. 17 at Lehman College." Wikimedia Commons has media related to Belmont, Bronx. This page was last edited on 3 April 2019, at 01:34 (UTC).